While I have no problem with a bagel every once an a while, I make an effort to choose foods that will keep me energized throughout the day. The truth is, a normal NYC bagel is a straight shot of carbohydrates, which without the right balance of fiber, protein and fat, can leave you feeling tired and even cause more cravings later on (read more here on how food can affect your energy). This bagel recipe was introduced to me last year by my friend Meghan and has been on repeat ever since! They are the perfect size and provide a ton more fiber (from the whole wheat flour and flaxseeds) and protein (from the Greek yogurt) to keep you fueled through your morning. I usually make a bunch and throw them in the freezer for an easy on-the-go breakfast option. A coconut chia bagel topped with avocado and smoked salmon. This is the original recipe and they are fluffy & delightful. The flaxseeds add some heart healthy omega-3s and the whole wheat flour is a good fiber source. With the least ingredients of the 3 recipes, these are by far the simplest version to make. I find these taste most similar to an actual bagel, so they may be a good starting place if it’s your first time making them! A sesame bagel made with the original whole wheat recipe. This is the same recipe as the original, however, this time I subbed half of the whole wheat flour with almond flour. This brings down the carbs a little & adds some healthy monounsaturated fat to the bagel. If you are carb-conscious, you may like this variation better! Almond flour bagel with peanut butter and “jelly” (aka mashed raspberries). I looked in my pantry one morning and noticed a bag of chia seeds that I hadn’t played with in a while. 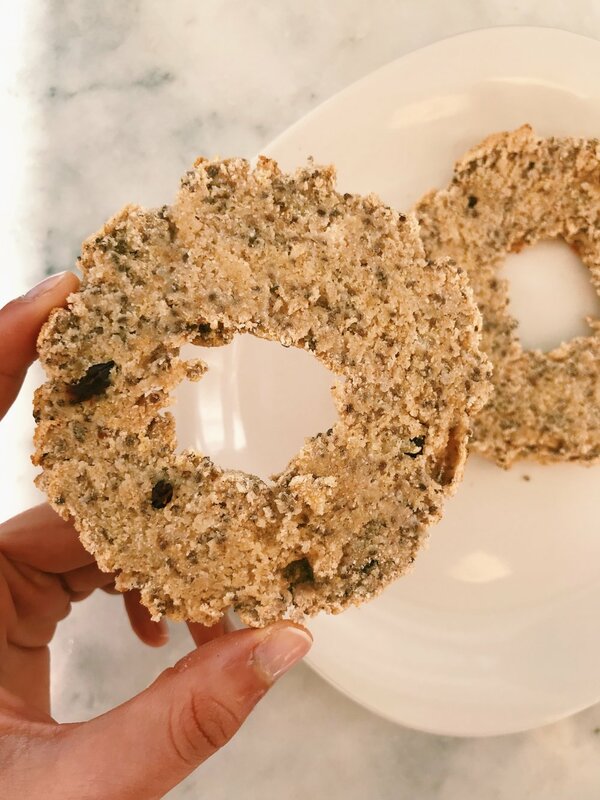 In the effort to build a really high-fiber bagel, I replaced half of the whole wheat flour with coconut flour & tried swapping the flaxseeds for chia seeds. I find this combination to make the biggest & most filling of the 3 options. They are slightly more dense than the original recipe, but I love the texture and flavor! The inside of a cinnamon raisin coconut-chia bagel. Begin by setting the oven to 350 F.
In a large bowl, mix the flour (either whole wheat, almond or coconut flour), flaxseeds (chia seeds if using the coconut recipe), baking powder & salt to a large bowl. Use a whisk to mix well or use a sifter if you have. Note: if making cinnamon-raisin version, add in cinnamon at this step. Add in Greek yogurt — Begin by mixing with a spoon and then use your hands to combine it into a dough. If following the coconut chia recipe, add 1 egg in at this step as well. Note: if making cinnamon-raisin version, add in raisins at this step. Separate the dough into 4 equal parts and form bagels (easiest way is to roll it out into long ropes and pinch the ends together). Beat an egg on the side and brush the egg wash on top of each bagel. Top with whatever toppings you choose (everything but the bagel seasoning, poppyseeds, sesame seeds, etc.). Bake in oven for ~20-25 mins. When the bagels feel almost done, turn the oven up to 500 F and bake for an additional 5-7 mins or until the tops are brown.